Penn State, 6-0 and having climbed to No. 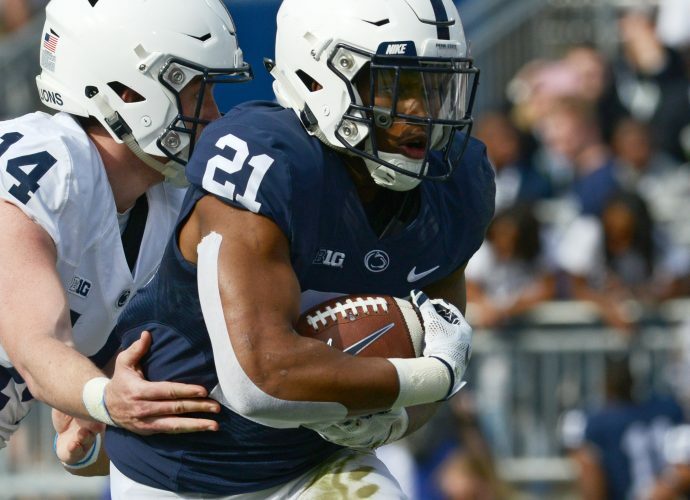 2 for the first time in almost 20 years, taking on Michigan on the grandest of whiteout stages at Beaver Stadium before a national TV audience, boldly underscores how far the Nittany Lion program has come back from the depths of the depths six years ago. This incredibly impressive resurgence, which has produced 15 wins in the last 16 games, including 11 straight victories against the Big Ten, has set the stage for possibly the best three-game regular season stretch since Penn State joined the Big Ten in 1993. Versus Michigan. At Ohio State. At Michigan State. If the Nittany Lions can negotiate that gauntlet — and it’s a very large if — the blue and white bandwagon rolling toward another Big Ten title game and potentially a berth in the College Football Playoff (and with it a possible matchup against, dare I say, Alabama) will need extra seating. But, whoa: First things first. Michigan may have tainted its end of tonight’s bargain by stubbing its toe against rival Michigan State, thus denying the ESPN hype machine a matchup of unbeatens, but that doesn’t make the Wolverines any less dangerous. In fact, they may be more so now that they’ve seen their own blood. The greatest of the great programs don’t always go unbeaten, but check out the records of people like Nick Saban and Urban Meyer after they’ve taken their first loss. They’re usually unbeaten from that point to their bowl assignments. Michigan may not be quite at that level this year. We’ll find out. Even though Jim Harbaugh is the second-highest paid coach in college football at $7 million annually — making only less than Saban, and slightly ahead of Meyer — he’s also 1-4 in his last five against Ohio State and Michigan State. He’s 2-0 against Penn State, which means he’s 2-0 against James Franklin, but Harbaugh still has a lot to prove. To sustain and build on the greatness last year’s team achieved, he has to prove he can beat Michigan, especially at home and especially with the Wolverines’ offense struggling minus their starting quarterback. But don’t sell Michigan short. The Wolverines represent a legacy of toughness that they’ve shown time and again in the Penn State series, once winning nine straight including against some of the Nittany Lions’ most talented teams (1997, 1999, 2005). The Penn State-Michigan relationship is unique in that it features two of the most storied programs in college football history, and yet they both target Ohio State with more heated passion — Michigan obviously because of its longstanding status as the Buckeyes’ top rival and Penn State because it’s closer geographically along with having some previous history. Prior to joining the Big Ten, the Lions played Ohio State eight times, but they never played Michigan. Every time they meet, inside the nation’s two biggest stadiums each at 106,000-plus, it’s high drama. That’s why tonight’s matchup, and the doors it can open for the winner, doesn’t get much better than this.